Football sessions for girls of all abilities aimed at increasing participation in the sport and raising the confidence of young people. There are 8 sessions each week in a variety of locations mainly schools for girls aged 11-18. Take part in a fun and relaxed environment with your friends. The Premier League Girls Football Programme from the start of the 2016/17 season the programme is being delivered by 91 professional clubs who provide a wide variety of sessions aimed at different audiences. 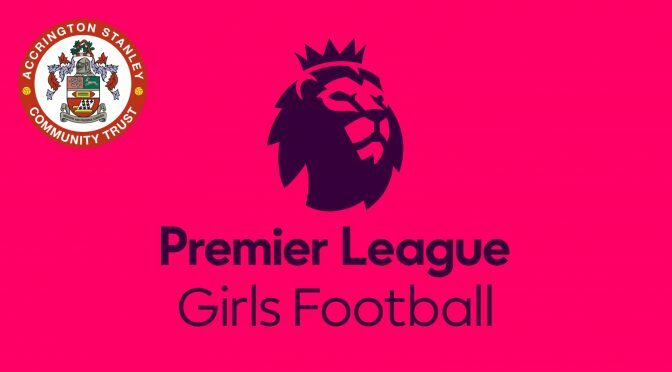 Nearly 9,000 girls have been engaged in the PL Girls Football programme since August 2015. Accrington Stanley aims to coach football to over 200 girls in the first year. Many of these girls had never played football before but now thoroughly enjoy the sport thanks to Accrington Stanley. Accrington Stanley Female Football Development Officer, Elle Kayley explains how we attracted girls into the sessions who have never played football before ‘We found that a number of girls wanted the exercise element rather than just play football therefore we incorporated sessions concentrating on different exercises and stretches. We also delivered team games and races to boost the girl’s competitiveness and enjoyment. This programme is free of charge for schools and sees Accrington Stanley coaches come in for the academic school year to girl’s football sessions.